This hotel has entire suites dedicated to Pearl Jam and The Beatles . Beatles Radio: The Beatles, Solos, Covers, Birthdays, News The Fab 4 and More! 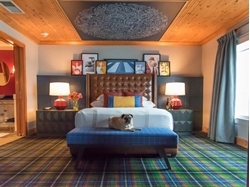 The Edgewater Hotel in Seattle has transformed two of their suites into a super-fan's wildest dreams, paying homage to two of the most iconic rock bands of all time. The Beatles-inspired suite is 750-square-feet, with a king bed, living room, dining area, fireplace and European spa bathroom. Beatles albums, LP covers and Beatles-related art span the walls of the suite, which overlooks Elliott bay and the Olympic mountains. The Beatles stayed in room 272 of the hotel in August 1964, the site of their famous window fishing photos. The Pearl Jam suite was designed with the assistance of the band and its fan club. Industrial, grunge-inspired decor line the walls, including a Mother Love Bone logo which rests above the bed. The hotel has pledged 10 percent of all proceeds from the room from now until Pearl Jam's Seattle shows in August to end homelessness in Seattle.